prof. emer. Jonathan Woodham, University of Brighton: “Meeting the past, experiencing the present: Some thoughts about design history”. prof. Sara Kristoffersson, Konstfack, Stockholm: “Why history matters”. Panel discussion with main speakers and: Leena Svinhufvud (Museum lecturer, Designmuseum, Helsinki); Guy Julier (professor, Dept. 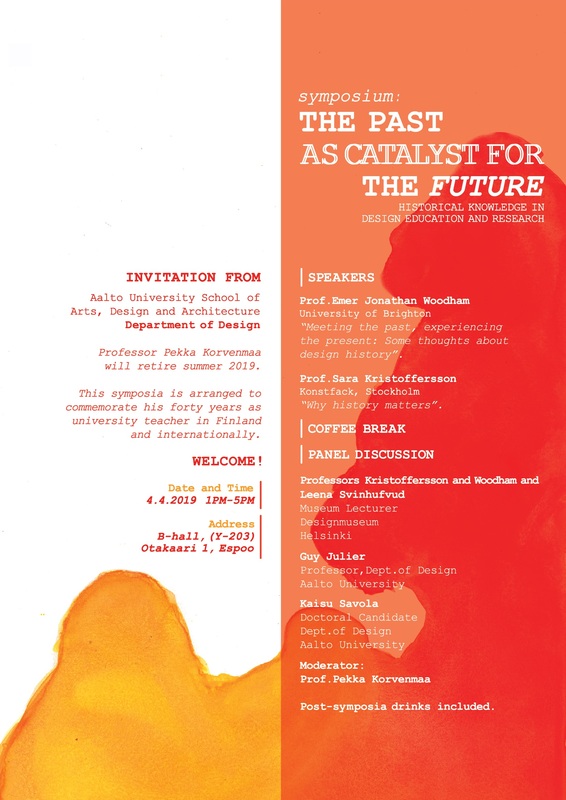 of Design, Aalto University); Kaisu Savola (doctoral candidate, Dept. of Design, Aalto University). A coffee break and post-symposia drinks included. The term ‘user-centred’ design comes with a range of associated practices, including human-centred design, participatory design and co-design. As with these, user-centred design has a mixed pedigree, including developments in the 1960s stemming from ergonomics in Scandinavia and elsewhere and human-computer interaction (HCI) explorations of the 1980s. It therefore covers a variety of expected ‘users’, objects and situations as well as politics. But does the term risk reducing conceptions of users to mere consumers? How does it engage, if at all, with social practices beyond the individual? Does it capture the complexity of economic, social and cultural contexts and actions? Who is the user in any case!!?? These and many other questions that will be debated. Claudia Garduño García is Partner and Research Director, Design Your Action, Mexico City. Design Your Action is an NGO focused on exploring collaborative solutions that are innovative, pertinent and relevant to complex social situations. Its object is to community action at various levels of social innovation that improves quality of life and collective wellbeing. Claudia was Project Manager of the Aalto LAB in Mexico and holds a PhD in design from Aalto University. Sampsa Hyysalo is Professor of Co-Design at the Aalto School of, Art, Design and Architecture. Sampsa’s research and teaching focus on codesign, user involvement in innovation and the co-evolution of technologies, practices and organizations. He received his PhD in Behavioral Sciences in the University of Helsinki and holds a Docentship in information systems, specialising in user-centered design. Sampsa has published over 40 peer reviewed articles (jufo ranked), 10 refereed book chapters and 5 books, out of which the two most important are The new production of users: Changing innovation communities and involvement strategies (with Elgaard Jensen and Oudshoorn, Routledge, 2016) and Health Technology development and use: From practice-bound imagination to evolving impacts (Routledge, 2010, New York). Rose Matthews is a Design and Innovation Lead with global experience in developing new interventions for public health and in identifying economic opportunities for restricted income communities. Having initially trained as a nurse in the UK, Rose turned to design as a way to achieve greater impact on a larger population and has never lost sight of that aim. She currently works on global health, financial inclusion and government programmes with a focus on underserved populations. Päivi Hietanen, City Design Manager of the Helsinki Lab. After a 16 month break, the Design Culture Salon is re-established in Helsinki. We are starting off with a local question of ‘What is Finnish Design Culture?’. Finland is hot. Hardly a day goes by without an article in the international press extolling the virtues of Finland’s more equal society, its high happiness index and, of course, the strength of its design. But what are Finnish design’s strengths, weaknesses, opportunities and threats? How is Finnish design culture shaped and what consolidates it? How does the turn towards service design and design thinking re-shape conceptions of Finnish design? Is it appropriate, in an era of globalisation, to talk about design in national terms? These are just some of the questions we shall be discussing with our panel. Päivi Hietanen works as a City Design Manager for Helsinki Lab that implements design thinking within the City of Helsinki. Päivi manages the operations of the Lab that supports city divisions in developing their services and customer experience, based on the new Helsinki City Strategy. The goal is to combine design, digitalization and dialogue to create better city together with the citizens. Päivi holds a Master´s degree in architecture from University of Oulu. During WDC Helsinki 2012 Päivi managed a major design program that promoted design thinking in public and third sector organizations. Petteri Kolinen is an industrial designer and holds a Masters in Design Leadership. He has a long experience in various managerial positions in design from diverse industries. In 1993–2007, Kolinen worked at Nokia as Design Manager, responsible for various teams, as well as e.g. managing the Design Studio at the Keilaniemi headquarters. After this, he was a member of the Group Management Team and Design Director at Martela. He joined Design Forum Finland from Nanso, where he held the post of Creative Director. Kari Korkman, is the founder and director of Helsinki Design Week and the President of World Design Weeks. He has been involved in a large number of product development projects and launches since the beginning of the 90s and has produced and curated a number of design exhibitions and events. Kari has received much recognition for his achievements in the design business and for activating city culture. Suvi Saloniemi is a specialist in contemporary design and visual arts. Since 2012 she has been the Chief Curator of Design Museum Helsinki, a Finnish specialist museum founded in 1873 with a collection of 75 000 objects. Her expertise is in Scandinavian design, collectible design, critical practises, museums and global design networks. Her international tasks include projects in NYC, London, Stockholm, Moscow and Seoul. She is an active speaker, and has many positions of trust such as nominator for the Designs of the Year in London Design Museum. She has newly started in the advisory board of Chart Design Fair, Copenhagen. Suvi Saloniemi’s background is in art history studies at the University of Helsinki and at the University of Stockholm, and in curating studies at the Aalto University of Art, Design and Architecture. Friday 9 June, 2017. Muzzy-headed after election night, panelists and participants for the final Salon of this season filed into the dark of the ICA’s cinema space for an afternoon of laughter and concern. As a panel on the Performance of Protest, this was to focus more on the thought that, as Aidan McGarry pointed out, democracy takes place beyond the ballot box. So what ever viewpoints on the election night before remain, the struggle goes on. Beyond the ballot box is where attitudes and political viewpoints get changed, Aidan argued. It is where positions are played out in various locations and through various media. Performance is important in this. Often, this fills out cultural fissures — the unsuspecting gaps where we don’t necessarily expect political utterances — with challenging messages. 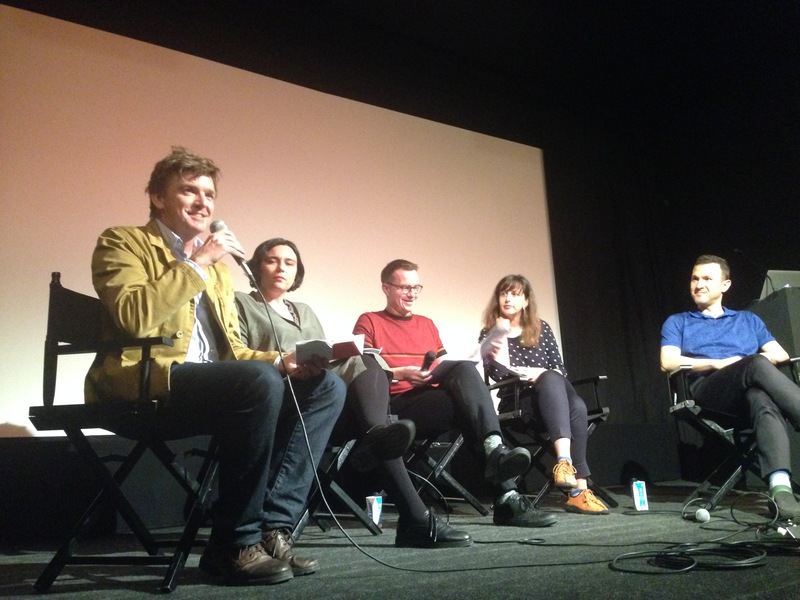 The panel itself was built on an AHRC-funded research project at the University of Brighton that is investigating the ‘Aesthetics of protest: Visual culture and communication in Turkey. This a country where, currently, there are sometimes heavy consequences to such acts. Pelin Başaran reminded us that deep strains exist at the backdrop to protest. In recent years in Turkey, over 100,000 civil servants have lost their jobs as a result of political tensions. Given the challenges of public protest, new spaces have to be found which both avoid issues of censorship but also by their very act may draw attention to the processes of censorship at the same time. What are the choices? Presentations by Işil Eğrikaruk and Umut Korkut showed two complementary opposites. One is in the staging of complex, spectacular events that are absurd, playful and revealing. The other is in making an event of the mundane, where the simplest act becomes a radical gesture. It’s about context, of course. In broad terms, Umut Korkut noted how authoritarianism may not necessarily disappear upon regime change. Drawing from his research in Hungary, he argued that while a backdrop of moving from command-economy state socialism to neoliberal models takes place, authoritative styles may remain and/or be extended. The use of absurdity therefore becomes a last resort in preserving hope and dignity — it outflanks the opposition. The 2013 Taksim Gezi Park protests in Istanbul were undoubtedly important in the unfolding of various tactics of protest. The protests themselves stemmed from objections to a plan to demolish the park and build a shopping mall and luxury flats in its place. However, beyond the concerns for the denigration of public space and environmental destruction, objections rippled out so that the Gezi Park was transformed into a symbolic space for the assertion of other positions (for instance, LGBT rights, rights to assembly or the defence of secularism). Within this, particular actions and objects became iconic: the ‘Lady in Red’; the makeshift gas mask (exhibited as part of the V&A’s ‘Disobedient Objects‘ show); the whirling dervish in gas mask. These became international, digital media events that were moved around the world that were associated with the Gezi Park protests but also a more general translation of concern into visual and material form. Ordinary acts — practising yoga, playing backgammon, having a conversation — were also assertions of humanity among the turbulence of that hot summer. If nothing else, this demonstrates the richness and breadth that is available in the aesthetics of protest. ‘Change Will Be Terrific!’ This is the title of an artistic project that Işil Eğrikaruk and Jozef E. Amado undertook in 2012. It involved a proposal to buy and exhibit the Pyramids, Parthenon and Palymira in Istanbul’s Taksim Square (before the Gezi Park issues kicked off, therefore). It culminated in a performance, photo series and rap that were presented through the medium of a TV chat show. Again, the political messages in this were multiple including the absence of new cultural developments in Istanbul and Turkey’s isolationism from its neighbours. This sophisticated project was full of twists and turns, unfolding in sometimes improvised ways as historical events caught up with it. The close relationships of the spectacular and the mundane in the context of the aesthetics of protest seem inevitable. Borders between high and low cultural expression, the original and its serial reproduction or the functional and the symbolic are collapsed. Humour is poignant in both. Politics and protest isn’t just about hard facts and figures but also bout capturing the imagination. Something, judging by the surprise of the UK election results and their aftermath, that Jeremy Corbyn succeeded in it seems. Cue White Stripes, Seven Nation Army chant. This Salon came during the heady and feverish season of art and design degree shows in the UK. Once the display boards are dismantled, the degree results promulgated and we’ve swept up, there is often a feeling of summer ennui. Was the degree show worth it? What are these graduates going to do out in the post-University world? What have we learnt? And then the summer holidays pass, we relax a bit (perhaps) and then we get back to business as normal for the new academic year. All the panelists (including this one) agreed that we had – all for different reasons. Call us jaded if you like, but there was a unanimous feeling that there has been enough ‘training’ or ‘education’ of designers for a particular worldview (a predominantly neoliberal one) and that the only way to break this relentless cycle of disciplining individuals to be creative (in a very particular way) is to stop design schooling. Perhaps this could be basis of a new De.School…? Certainly, with around three times more design graduates each year than there are design jobs for them, it has been time to reconsider what design schools are there for a long while. That’s if we are to view design schools in their current dominant state: as worker-mills that churn out neoliberal-compliant, ‘industry-ready’ individuals to fill out the precariat of interships or the barely-paid short-term contracts that make up the junior labour force of the creative industries. But, perhaps, if we see the role of design schools to decouple design research, education and practice from the multiple vectors of neoliberalism then we can pull them back from this brink and rethink them. 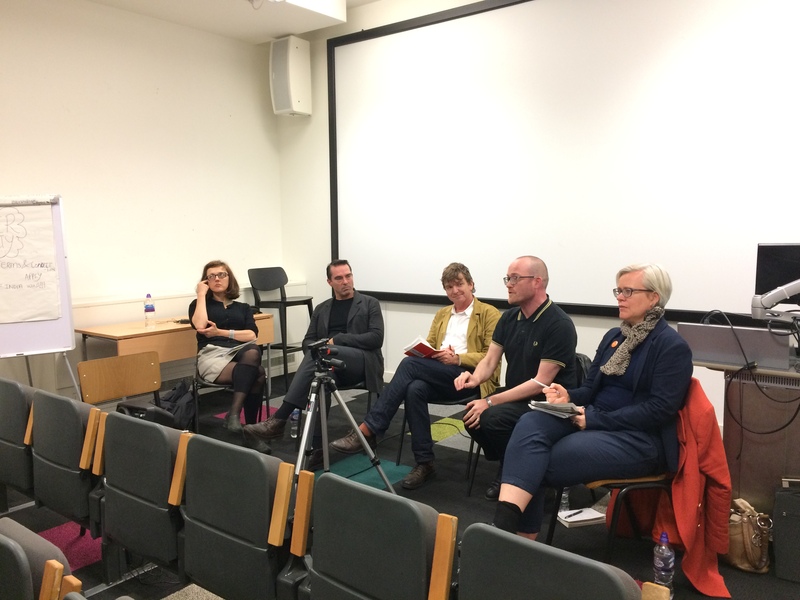 For me, and drawing a bit on the reflections of other panelists, Johanna Boehnert, Jamie Brassett and Cameron Tonkinwise, this requires a reframing of the output of design schools. By this, I don’t just mean the skills and knowledge that graduates leave with but also the way by which they are presented. While degree shows provide a nice opportunity to celebrate material output, see old friends and have a glass of warm white wine, they largely reproduce the performative spectacle of design as told through the reified object. Of course, I’m not the first to say this, and, indeed, these Design Culture Salons are, in part, a way of coming at design in a different way from this, to open up its fissures and discourses. So how do we align the important work of design in exploring and extending material realities in ways that confront, adjust and/or articulate the multiple crises (of capital, of environment, of equality, of representation, of identity etc.) that we are facing? Before I answer this, let me add in a rejoinder. This is that we should be talking about design schools rather than the design school. We should resist all those totalising notions of design and the design school (which, by default, means ‘design in service mode to neoliberalism’). If I sound like a broken record then fine, but there are many models for design schools that provide starting points: craft-based, business-oriented, user-centred, individual-focused, teamwork-developing, engineering-driven, sustainability-grounded and so on. The difficulty, though, is that they still currently come under a singular rubric of employment culture and politics. They are still pretty much about training for a very specific set of economic and political circumstances. In recent years, we have seen increased spillage of design research and practice into other knowledge domains through approaches such as design thinking, social design, design anthropology, strategic design, design for policy, transition design, design culture as practice and several other specialisms. Design education has lagged behind these, though. However, would it not be compelling to stop worrying about these in the design school, but to site design education outside its traditional settings? In social science departments, medical schools, healthcare settings, or community centres, for example? Can these be the kinds of places where design education can get reframed in powerful, informed and challenging ways? Anyone who has visited the former Bauhaus school in Dessau will be struck by their majestic, utopian environment. This utopianism — of the hermetically sealed, creative environment — lingers on in most design schools. Half a century ago, design students and tutors were talking about throwing bricks through the Bauhaus windows, but this was just the beginnings of a stylistic break with Modernism. Generally, they have been peering outward through these broken windows ever since. Few have climbed out of them to establish themselves elsewhere, though. Such moves might not entirely remove design and design schools from the neoliberal order. I’m not sure if neoliberalism can ever be fully eradicated (pace Simon Springer). But we still have to come back to the original proposition of this Salon and talk about this connection and how it can be redirected. The first step is to reveal and explain the deep links between the two. The next step might be to explore how design can function, along with other fields, in new and different ways. Design schools sit at a pivotal place in enabling neoliberal assumptions, processes and institutions. Design is a practice involved with making new ways of living possible by inspiring particular feelings, attitudes and subjectivities. Neoliberalism depends on having its ideological premises accepted and internalised and thus one of the primary roles for design is to create an illusion of wholesomeness that masks exploitative dynamics. Designers are involved in constructing the subjective grip of the neoliberal order — but we can do other things. Design schools need to make these options clear. The only way we can do this work is with a critical approach to the power. Design schools that want to enable…progressive futures that serve rather than exploit young people need to check their politics now. 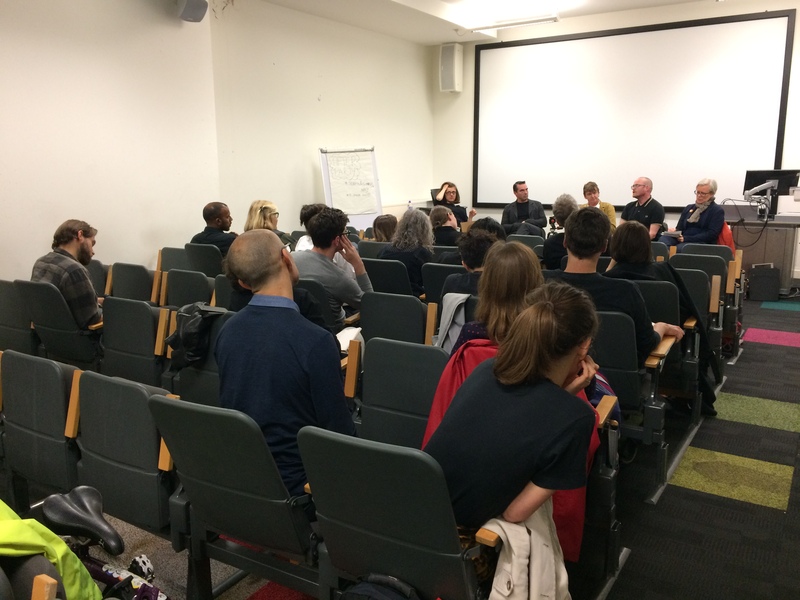 This panel discussion focusses on the relationship between art, protest and performance. Recent years has witnessed a huge increase in the number of protests around the world which have challenged economic institutions and political practices, including the Arab Spring, Occupy movements, pro-women’s movements in the US and beyond, and anti- austerity movements across Europe. Protestors have a range of options open to them in order to get their voice heard and increasingly protestors use aesthetics in order to communicate their ideas to the public. The role of social media in amplifying the performance of protest is considered, especially the production and dissemination of visual imagery. 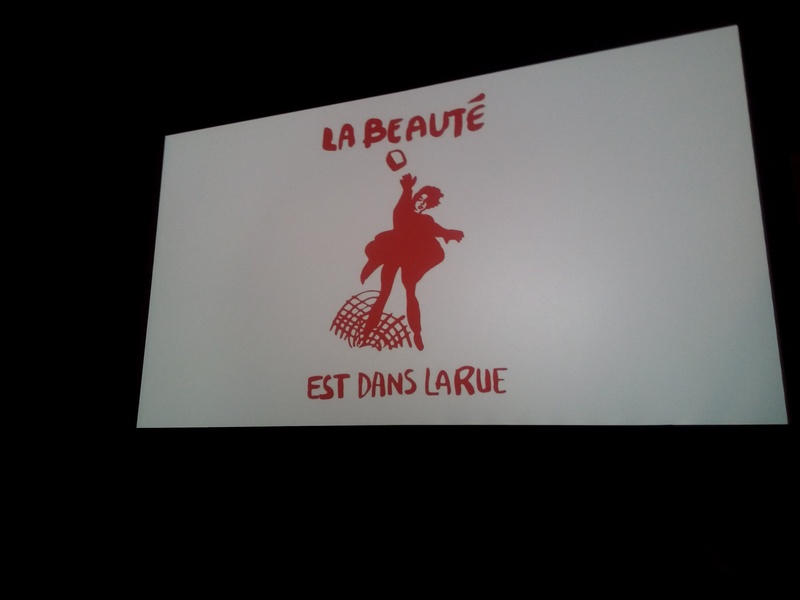 The aesthetics of protest may include visual, material, textual and performative elements of protest, such as images, symbols, graffiti, clothes, art, but also other elements such as forms of rhetoric, slang, humour, slogans, as well as the choreography of protest actions in public spaces. This panel brings together artists/practitioners and academics to discuss the performance of protest in contentious politics. Whilst panelists will discuss Turkey and the Gezi Park protests in particular it will other explore manifestations of the performance of protest around the world. This event is part of Crossings: Stories of Migration, an ICA-led UK-wide film and events programme organised in partnership with the Goethe-Institut and with support from the BFI, awarding funds from The National Lottery. What’s the future for design schools within neoliberal universities? Is design accelerating the neoliberalisation of universities or affording pathways to alternatives? Should design schools take the lead or take leave of universities? In the UK, change is afoot in multiple domains – not just the future of the country, its relation to Europe and its constitutional make-up, but also the ways it enables teaching and learning and does research. Like universities in general, UK design schools in particular face a number of challenges including: falling numbers of student applications, limitations on non-UK students studying and remaining in the UK after graduation, reduced academic autonomy, changes in public funding and the valuing of STEM above STEAM (eg http://chead.ac.uk/policy-update), even while the creative and cultural industries grow at a higher rate than other economic sectors. Current emphasis on teaching excellence, graduate employability, audit culture and demonstrating research impact mask a deeper problem – uncertainty about the roles and capacities of design’s higher educational institutions to produce people equipped to deal with lives of change and disruptions to the nature of work, place, well-being and belonging. Attempts to articulate the specificity and contribution of design higher education are undermined by ignoring its location within institutions that are increasingly expected to reproduce, rather than question, dominant economic models and thinking. Market models of design education such as Hyper Island, Kaos Pilots and General Assembly, online initiatives such as IDEO U, alongside more critical exploratory approaches such as The University of the Underground or the Free University Brighton indicate emerging futures for design schools – which may not be in universities. Taking an oblique angle to consider these topics, this panel discussion will share insights on higher education in design informed by innovation studies, design activism, philosophy and social design. To book a place please email: n.baileycooper@arts.ac.uk.